Jeff, I appreciate the way you separate announcements from worship at GBC. We do the same thing at Immanuel by placing them at the end of the service after the closing prayer. But we also have a time of congregational prayer along with the announcements — something that is a bit easier to do in a smaller church setting. As I think about the issues you have raised, and as I try to think afresh about the worship services at Immanuel in light of your questions ad observations, a couple of things immediately come to mind. 1) Since our focus is on God's Word, and our desire is to allow His Word to create the emotional responses of worship, we read several Scripture passages throughout the service and focus our attention on creating a well-lighted atmosphere in which people may open their Bibles and follow along if that will help them focus their attention more fully on the Word. Thus we would avoid a platform lit by spotlights with a congregation sitting in the dark. I would also mention in this regard a couple of brief points. First, there is something unseemly about children of light gathering to sit in the dark, at least as long as they have a choice not to do so. 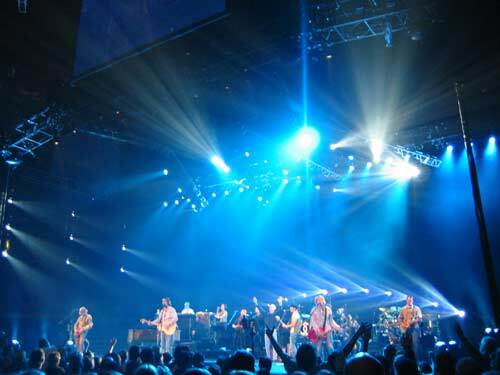 Second, in our culture the use of a dark stage with spotlights, laser lighting, and smoke machines automatically communicates psychologically an atmosphere of entertainment rather than worship, since these are the types of venues typically associated with stage productions. However, such is not the type of atmosphere we should seek in which to worship God. 2) Since the songs we sing should help us to worshipfully respond to what God is saying in His Word, then we are careful to choose songs with words that are compatible with this goal, and then we are careful to choose songs that have music that matches the emotional response that ought to accompany the Scriptures read and the words of the songs chosen. So, for example, we don't want to sing about sorrow for sin to a peppy tune, and we don't want to sing about the joy of forgiveness to a tune that sounds like a funeral dirge. In other words, the music ought to help us express the emotions that the Word is intending to draw out of us; it should not be chosen simply because it produces emotions whether or not the emotions it produces are appropriate. Thus, for example, if the Word read is is about the joy of our assurance of salvation, and people are listening with a desire to respond with the expression of such joy, then we don't want to sing a song with music that is sorrowful even if the words of the song are intended to express joy. The music should therefore serve as a handmaid to the Word and should help to express the message of the lyrics, a message that should itself help the congregation to respond appropriately to the word that has been read. These are just some thoughts that have come to mind as I am sitting here thinking about the issue. I hope I haven't rambled too much!